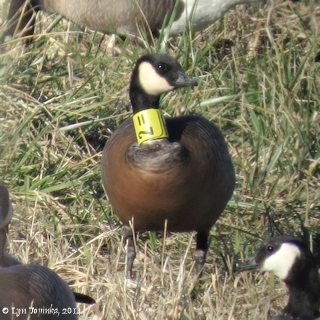 =EJ February, 22, 2016, yellow-banded Cackling Goose "=EJ" seen along LaFrambois Road, near the entrance gate, but flock (of around 200) flew before images could be obtained. 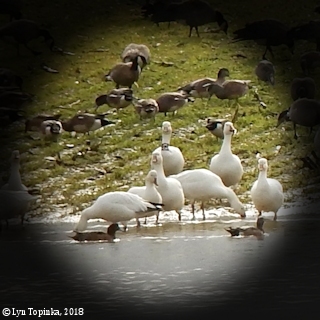 Click image to enlarge Cackling Goose "2%2", Ridgefield National Wildlife Refuge, Ridgefield, Washington. Overcast winter day. Image taken January 29, 2016. Nikon P900. 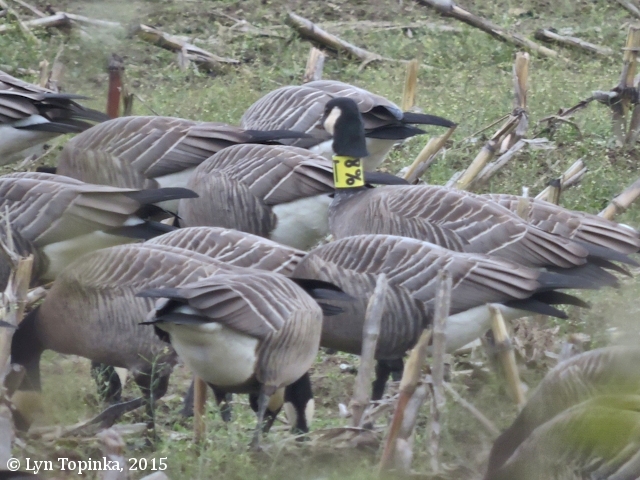 More RNWR banded Cackling Geese. Click image to enlarge Cacking Goose "H2=", Vancouver Lake Lowlands, Vancouver, Washington. Sunny, cold, and brisk. Image taken January 23, 2014. Canon SX50. 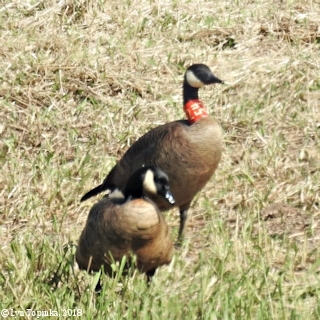 Click image to enlarge Cacking Goose "KE*", Vancouver Lake Lowlands, Vancouver, Washington. Sunny, cold, and brisk. Image taken January 23, 2014. Canon SX50. Click image to enlarge Cackling Goose, "N2=", Troutdale, Oregon. Overcast spring day with on/off drizzle. 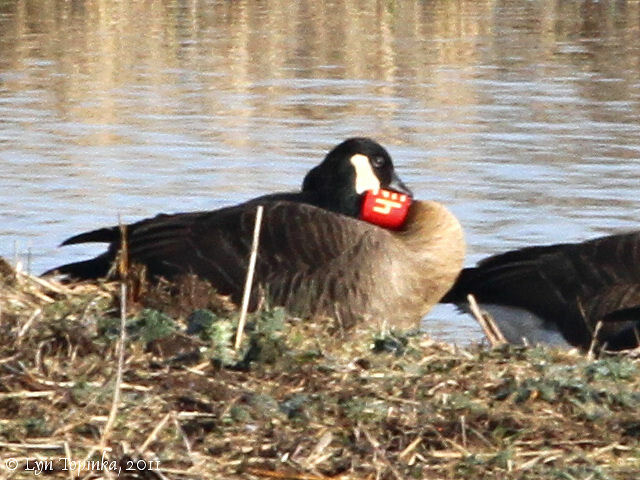 Image taken April 5, 2013. Canon SX50. 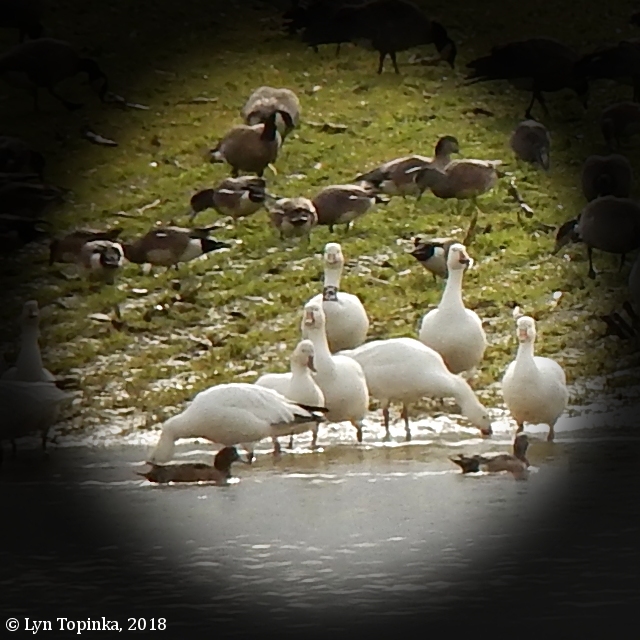 Click image to enlarge Cackling Goose "T%8", Vancouver Lake Lowlands, Vancouver, Washington. 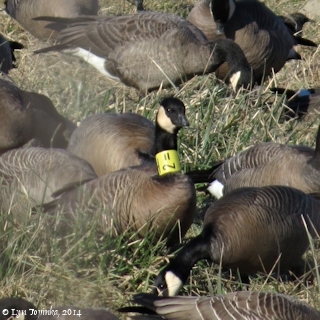 Located in fields opposite Vancouver Lake south of the flushing channel. 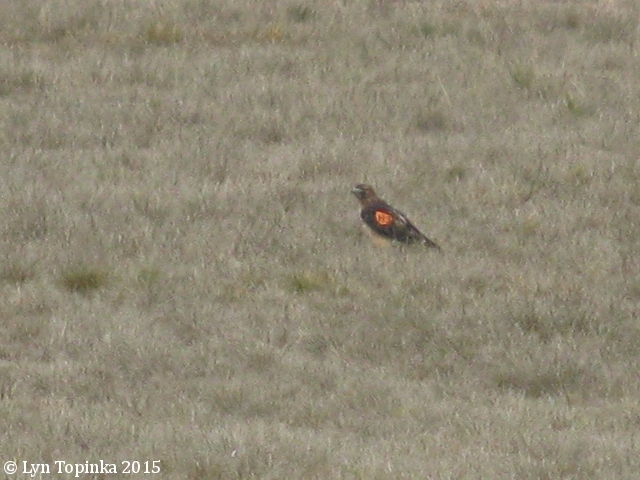 Image taken November 4, 2015. Nikon P600. 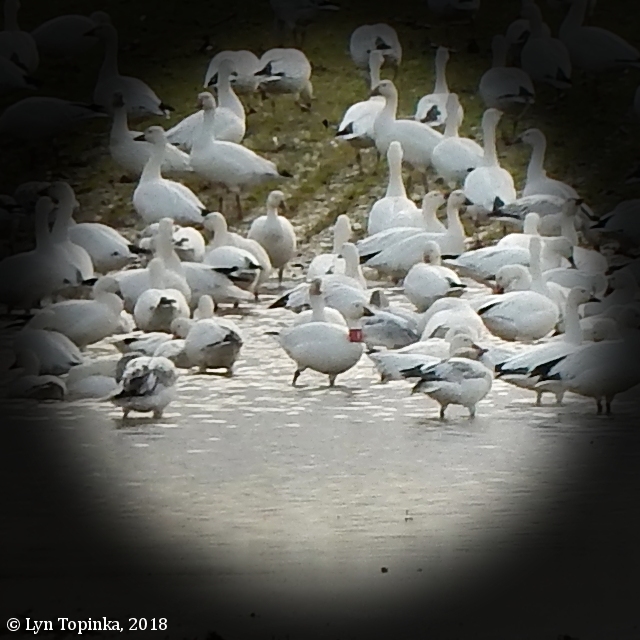 Click image to enlarge Caspian Tern, Rock Cove, Stevenson, Washington. Gorgeous summer day. Image taken July 31, 2014. Canon EOS 7d, 400mm. 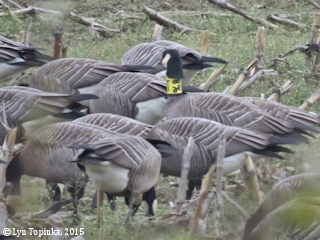 Click image to enlarge Banded Dusky Canada Goose, "21K", Ridgefield NWR, Washington. Image taken November 4, 2009. Canon EOS 7d, 400mm. More RNWR banded Dusky Geese. Click image to enlarge Dusky Canada Geese, "254", Vancouver Lake Lowlands, Vancouver, Washington. Image taken March 14, 2018. Nikon P900. 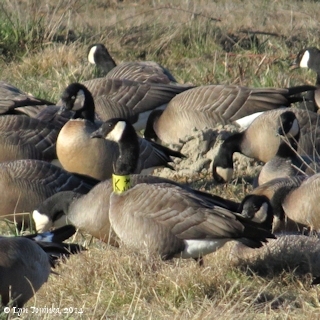 Click image to enlarge Banded Dusky Canada Goose, Julia Butler Hansen NWR, Washington. Image taken January 26, 2011. Canon EOS 7d, 400mm. Click image to enlarge Red-tailed Hawk, "9/A", Vancouver, Washington. Overcast day. Image taken November 23, 2015. Nikon P900. 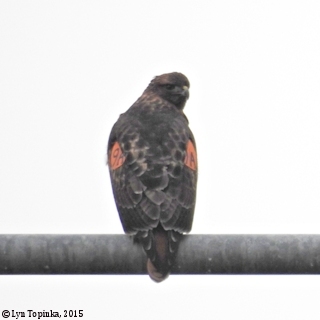 9/A hung out near the Vancouver Mall and could be seen from State Route 500. 9/A was first observed in October 2015. Last seen February 20, 2016. From pdxraptors.com ... "9/A was trapped at the PDX airport on May 29, 2015 as a second year bird. On May 30, 2015, 9/A was released in Clatskanie, Oregon. 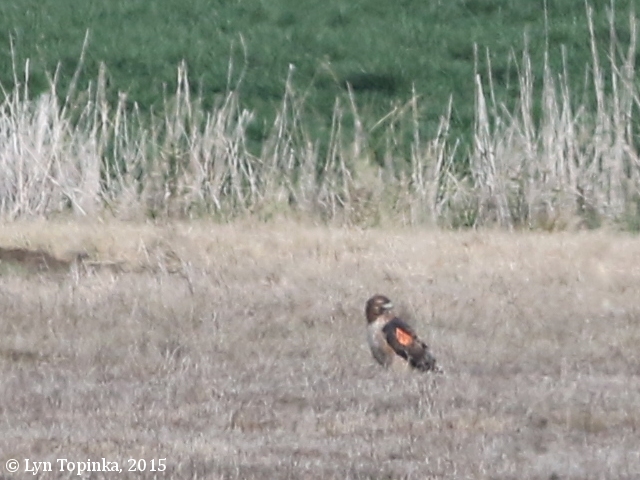 As you might have observed, this bird has a bill abnormality and is exhibiting long-billed syndrome. This syndrome causes abnormal growth of the bill. 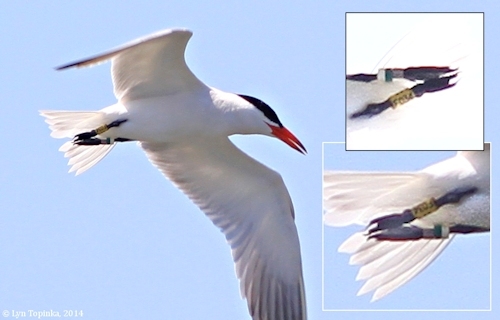 Fortunately, the long-billed syndrome is not impeding 9/A's ability to hunt and ingest food." Click image to enlarge Red-tailed Hawk, "H/3", Woodland Bottoms, Woodland, Washington. Image taken November 9, 2015. Canon EOS 7d2, 400mm. 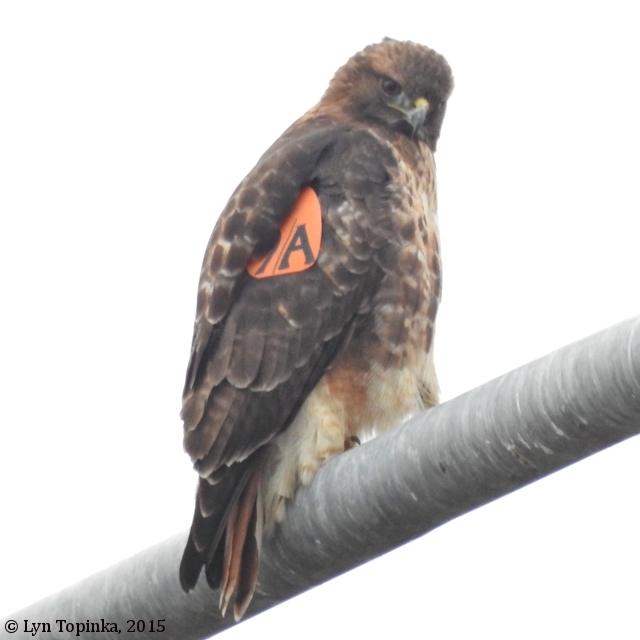 From pdxraptors.com ... "H/3 was trapped at the PDX airport on May 23, 2015 as a second year bird. 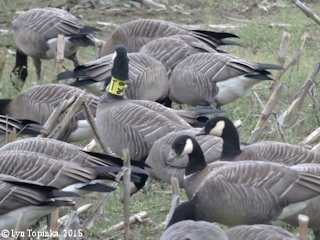 After being banded and wing-tagged, H/3 was then released in Clatskanie, Oreogn, on May 27, 2015." 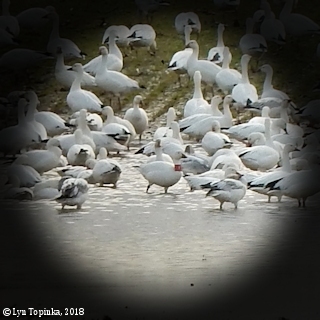 Click image to enlarge Red-collared Snow Goose (left) and blue-collared Snow Goose (right), Vancouver Lake Lowlands, Vancouver, Washington. 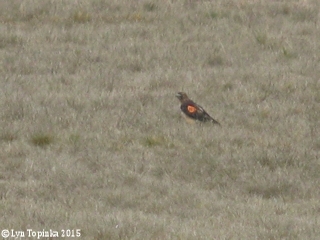 (DIGISCOPED). Cold overcast gray day. Image taken January 22, 2018. Nikon S9700. 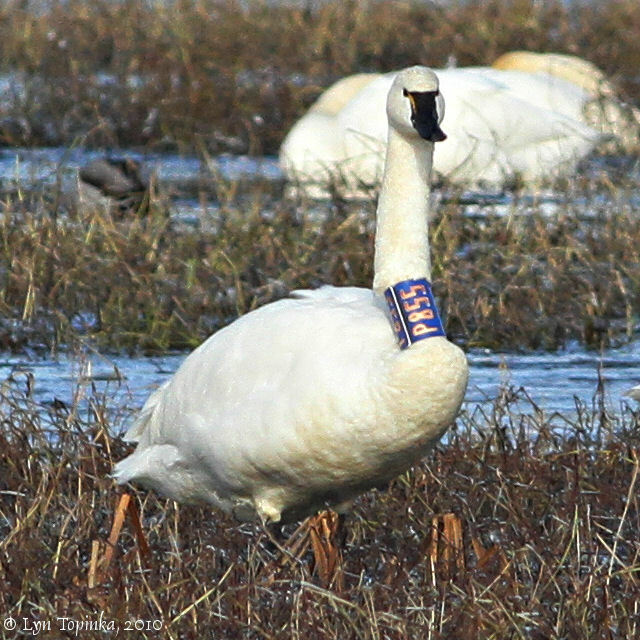 Click image to enlarge Tundra Swan, "P855", Ridgefield NWR, Washington. Image taken December 31, 2010. Canon EOS 7d, 400mm. According to Craig Ely, USGS Biologist Alaska Science Center, Anchorage, Alaska ... "P855 was banded as a second year (hatched the prior year) female on 23 July 2009, near King Salmon, Alaska." 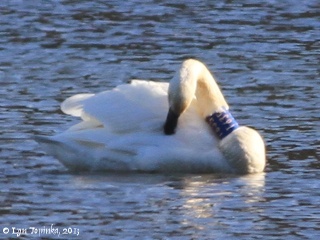 More RNWR banded Tundra Swans. Click image to enlarge Tundra Swan "T524", Ridgefield National Wildlife Refuge, Ridgefield, Washington. First seen on December 28, 2009. Seen again on January 8, 2012. 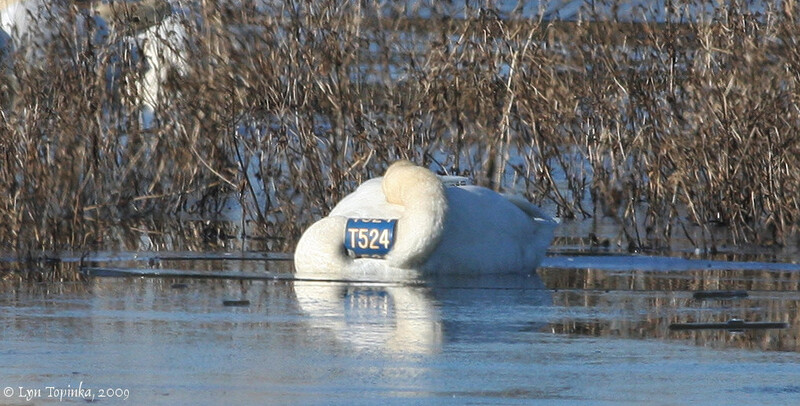 According to Craig Ely, USGS Biologist Alaska Science Center, Anchorage, Alaska ... "T524 was banded as a adult female on 26 July 2007, just north of Cold Bay, near the south end of the Alaska Peninsula."